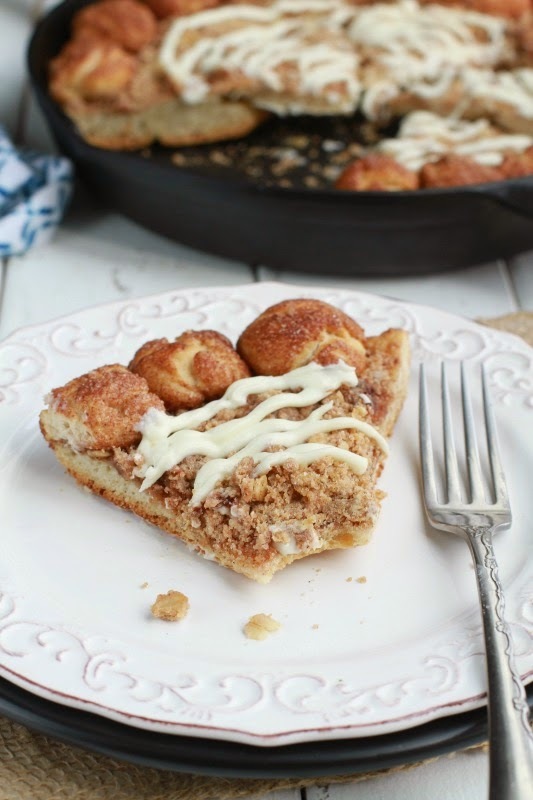 A cinnamon sugar streusel topping layered over an easy pizza dough with a drizzle of cream cheese frosting. 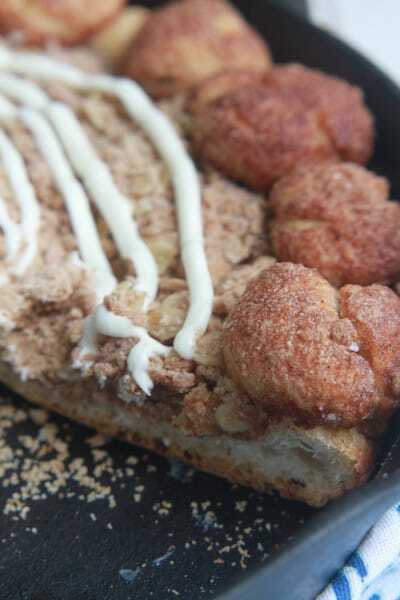 The extra special crust is made with cinnamon sugar crust bites which makes this even more delicious and fun to eat. We love pizza night at our house. It’s so much fun to pile on the toppings and they’re super easy to customize depending on what we all feel like. We usually make a few small pizzas with different toppings along with one dessert pizza which is our favorite part of the night. The boys in the family usually aren’t big fans of any kind of pizza crust (even stuffed or pretzels) but they do adore anything doused with loads of cinnamon and sugar. 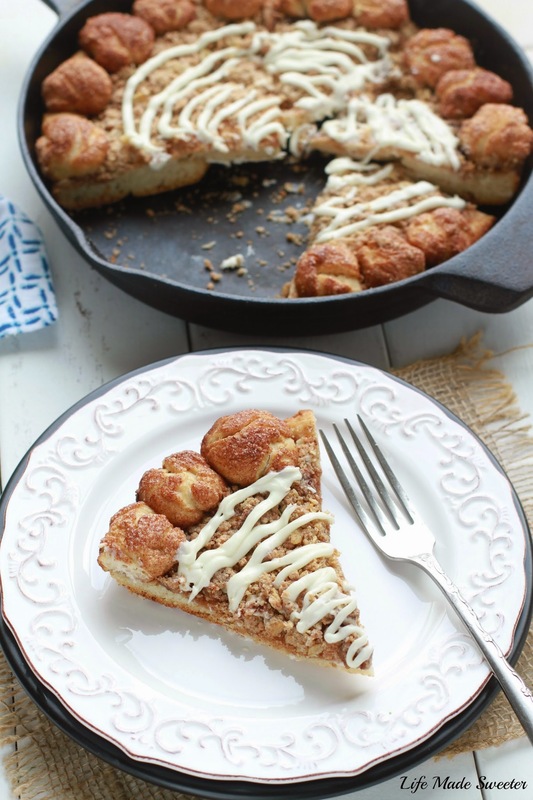 So for this dessert pizza I decided to roll up the extra pizza dough to make little cinnamon sugar crust bites and attached them to the pizza using those as the crust. You guys! It was a BIG hit! They loved the idea and polished off their plates clean which was amazing and totally helped solve the leftover pizza crust dilemma we always seem to have. It all starts out with our favorite easy pizza dough. You can also use your favorite dough or a pre-made dough from the store to make things easier but the 20 minute rise time on this homemade one makes it so worth it with very little effort. Once you have the dough, we press it into a 9″ cast iron skillet or a pie pan with a slather of melted butter on top. 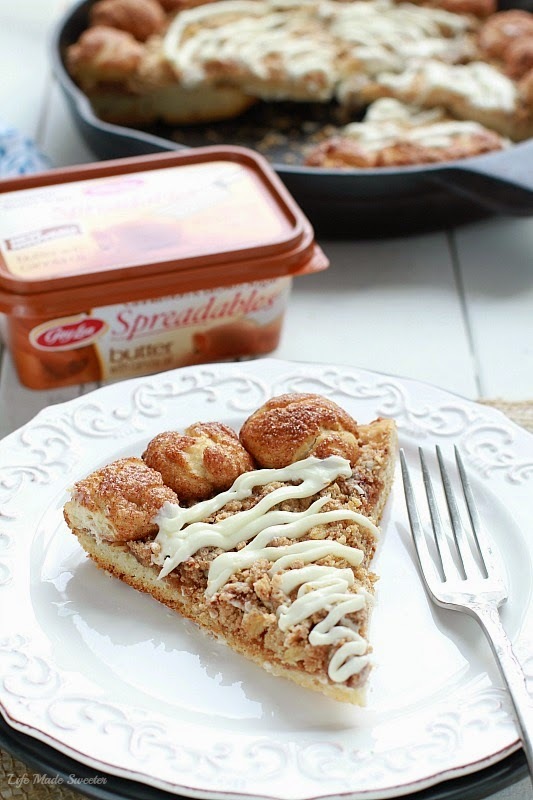 For this dessert pizza, I wanted to amplify the cinnamon flavor so I used Gay Lea Cinnamon and Brown Sugar Spreadables which is the perfect blend of cinnamon and brown sugar and it spreads right out of the fridge. Next, a generous layer of cinnamon sugar oat streusel is piled on top. Now we get to the fun part! Just take the extra pizza dough and roll them into bite sized balls — about a 1/2 tablespoon or so. Once you have enough to cover the outer rim of the pizza crust, dip each bite into some melted Gay Lea Cinnamon and Brown Sugar Spreadables or regular butter and then roll into a bowl of cinnamon sugar. Bake it up and then drizzle on some of that delicious cream cheese frosting. 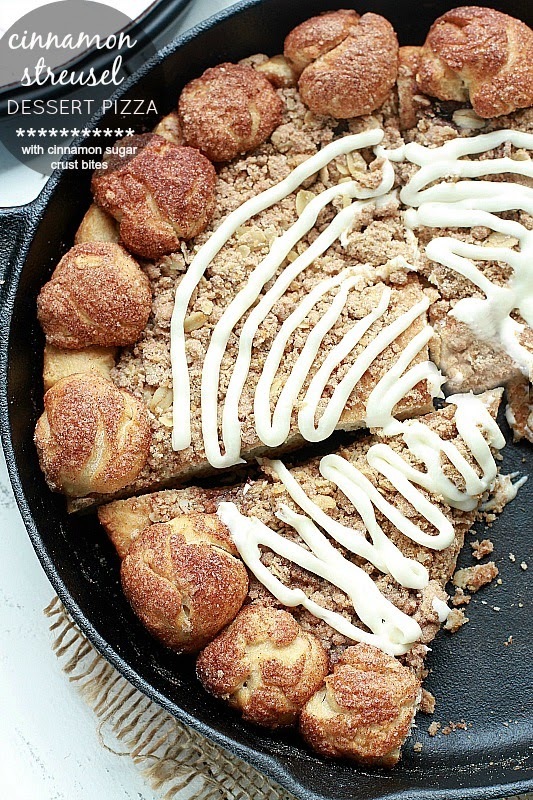 Pizza night just got a whole lot better now that the crust is made out of cinnamon sugar bites. Preheat oven to 400 degrees. Spray a 9" cast iron pan or pie plate lightly with cooking spray. Set aside. In the bowl of a stand mixer with the dough hook, mix together warm water, sugar and yeast. Let mixture sit for 5 minutes. Add flour and salt to the mixture. Using the dough setting on your mixer, turn on and mix until smooth. Leave in the bowl and allow to rise for 10 minutes. Roll the dough into a 9 inch circle and place in prepared pan. Using the leftover dough, roll into bite sized balls around 1/2 tablespoon in size. 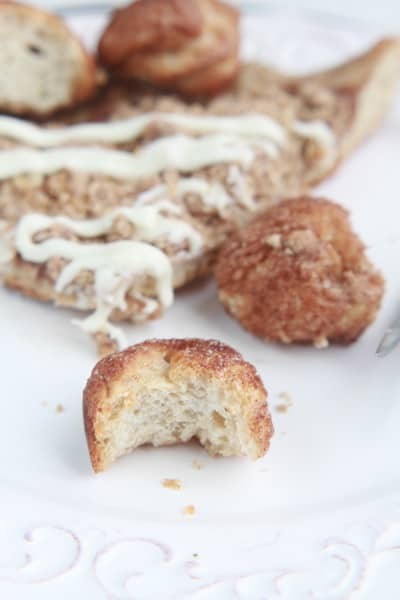 Dip in melted cinnamon spread butter and roll into a bowl of cinnamon sugar. Attach to the outer rim of the pizza. Meanwhile make the crumble allowing the dough to rest another 10 minutes. In a small bowl combine melted butter, brown sugar and cinnamon. Spread thinly on top of the pizza crust. In a medium bowl, combine all the ingredients using a fork or your fingers until pea sized crumbs form. Spread an even layer over cinnamon spread. Bake in the preheated oven for about 15 - 20 minutes or until crust and topping are golden brown. Remove from oven and allow to cool in the pan slightly. While the pizza is baking, in a stand mixer or using a hand mixer, beat together butter and cream cheese. Add powdered sugar and vanilla until combined. Place in a zip-top bag with a tiny hole cut in the corner and drizzle over dessert pizza. Serve while still warm. Now for a fun GIVEAWAY! 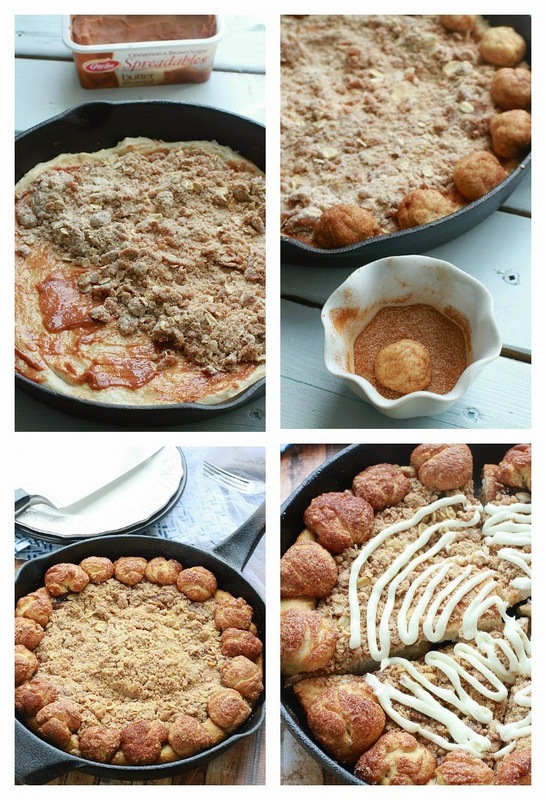 To celebrate all of the delicious ways you can infuse Gay Lea’s Cinnamon & Brown Sugar Spreadables into fun recipes, Gay Lea is giving away an amazing brunch kit consisting of one Cuisinart Professional Rotary Waffle Maker, one Cuisinart Conical Burr Coffee Grinder and one Staub En France Cast Iron 10” Frypan! The total approximate value is $340! The grand prize giveaway will be open until April 30, 2015. They are also giving away 1 year of free Gay Lea product (12 coupons for free Gay Lea product) to one of my lucky readers. This giveaway will be open until April 30, 2015. All my Canadian readers have to do is let me know what you would make in the comments section. Readers may enter across all Gay Lea Ambassador blogs, but they may only win on a single blog. Entrants must be a resident of Canada, however those in Quebec are unfortunately unable to enter the giveaway.